Many of you have asked about the specifics of food on the Via Francigena such as what meals are included as part of your package. In today’s FAQ blog we’re going to cover food in Italy, including meal times, courses, etiquette and what to expect, in general when dining on the Italian regions of the Via Francigena. 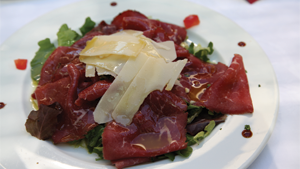 Italy is considered by many as being home to some the finest cuisine in the world. Food on the Via Francigena is all about wholesome, locally sourced, seasonal produce and dining is all about taking your time and enjoying the company of friends and family. Here is a thing or two that you should know before tucking into a meal in the culinary queen of Europe. It’s worth knowing that Italians don’t tend to eat a large amount in the morning. Breakfast is usually comprised of coffee along with something sweet such as cake or biscuits, in bigger towns you may find ham and cheese as part of the breakfast offering but let it be known that if it’s a full Irish breakfast you’re after, you won’t find it in Italy! Dinner in Italy is generally made up of three courses. To start is antipasto, which is usually a meat or cheese board or a combination of both. Next comes primo, which translates as the first, this dish is usually pasta or risotto. After that is the second dish or secondo, this will either be meat or fish and may also come with a side of salad. Meal times vary according to region and hotel. Dinner usually takes place around 8 o’clock but restaurants in the more northern parts will be more open to having dinner earlier with dinner time in the more southern parts of Italy being later. Standard packages with CaminoWays.com usually include two of the courses mentioned above and drinks are not included. On certain sections of the Via Francigena dinner will be held in a restaurant, in this case please alert the restaurant staff that you are a client of CaminoWays.com, they will then explain what is included. If you are still unsure of how it works please ask them to clarify and they will be happy to do so. If you have any food intolerances or allergies our reservations team will have notified your accommodation at the time of booking but please do remind them to be on the safe side. Italians are serious about their coffee and one thing in particular: when the clock strikes noon no more coffee with milk is consumed. Here at CaminoWays.com our very own reservations manager recoils in horror whenever somebody so much as utters the word cappuccino past 12pm. 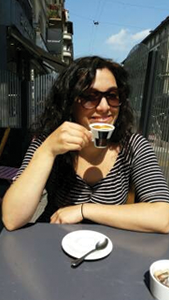 If you want to drink coffee like an Italian, it’s espresso only past midday. 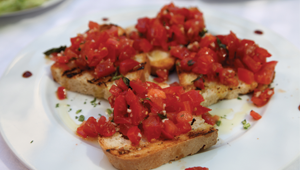 If you are lucky enough to find yourself in a bar in Italy somewhere around the hours of 6pm and 8pm you’re likely to be treated to an aperitivo, which is a free portion of food that comes with your drink, a lot like the culture of tapas in Spain. Italians are not known for scrimping on portion sizes and aperitivos can often come in quite a generous portion so you may even need to rethink your dinner plans! Standard packages with CaminoWays.com include breakfast and dinner but we are happy to tailor this to meet your needs! We hope that we have answered your questions about food on the Via Francigena, if you have any other queries please do not hesitate to contact us!